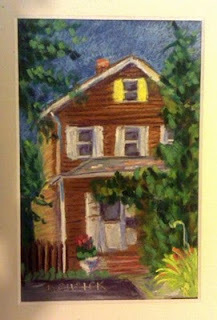 This is another of my mini-paintings, sized 4x6 inches. I did a bunch of these as gifts at Christmas time, and found it was rather fun doing a tiny painting. Tomorrow I am going out with 2 friends to celebrate the birthday of one of them, so I made this little portrait of her house to give her as a gift. I was out of practice with "tiny" but it was still fun once I got into the swing of it.